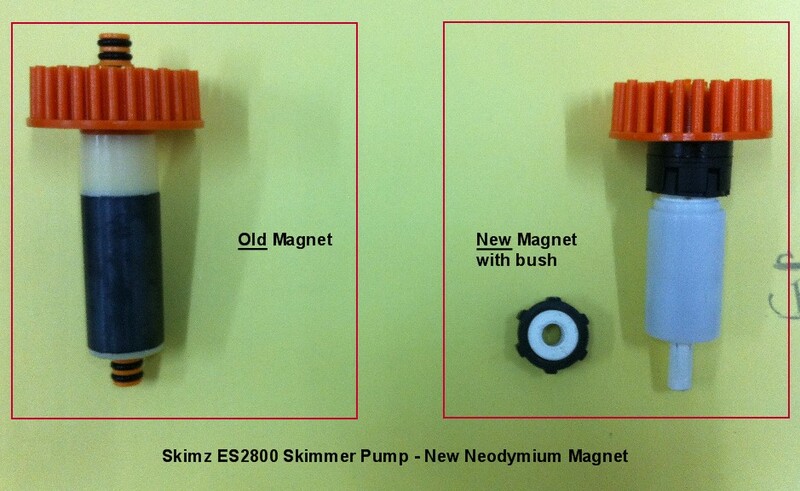 How to change the old magnet of Skimz ES2800 skimmer pump to new neodymium magnet. Using the new Skimz ES2800 neodymium magnet, the friction between the magnet and the Protein Skimmer pump will be eliminated. For Skimz Protein Skimmer models: SM161, SM162,SK201, SK202. I have emailed your company, and not recieved a reply in over a week. I have a 1 month old Sm121 Motor serial#E09186. The white collar on the impellar cracked and broke under normal operating conditions, rendering the skimmer useless. I now have NO operating skimmer. It appears this is not an uncommon problem. This is under warranty. Please respond asap, as I DO NOT want to run my marine tank without the $300 skimz skimmer that is 4 weeks old.